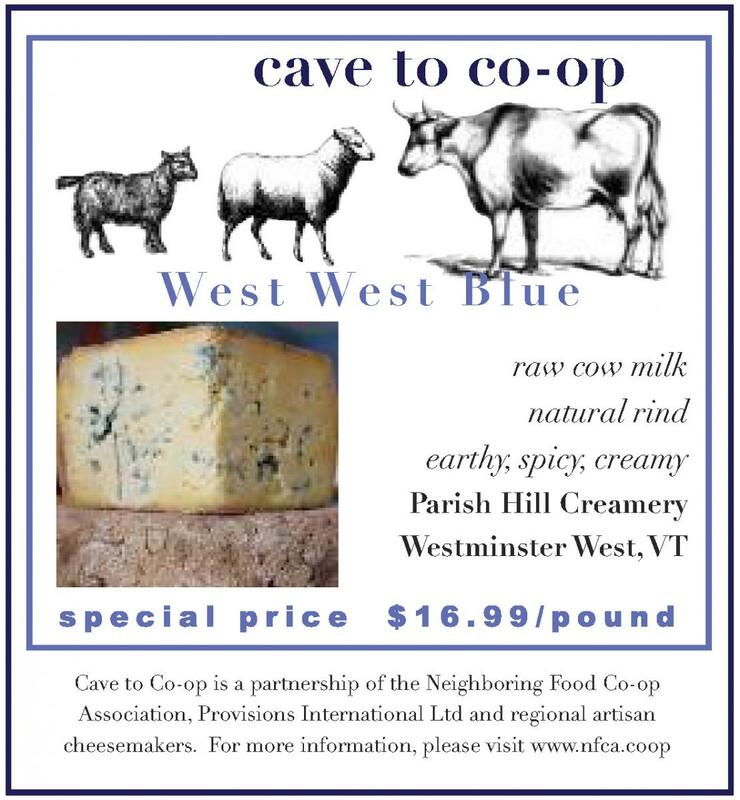 This month’s special cheese is WEST WEST BLUE from Parish Hill Creamery, Westminster West, VT.
West West Blue is a traditional, two-curd Gorgonzola, made with whole, raw milk from Elm Lea Farm. The cheese is made in a multi-stage process, with curds held overnight mixed with warm, fresh curds the next day. The colder curds have a higher acidity, which is a very attractive space for the blue mold to grow. The edible rind surrounds a dense paste with streaks of blue mold, a creamy texture and a spicy, earthy flavor. West West Blue is of course, delicious on its own, with perhaps a perfectly ripe pear, some serious bread and a smackerel of honey. But here are some seasonal recipes that highlight its gorgeous flavor. Place cheese, butter, celery, onion, garlic and a pinch of pepper in a blender or the work bowl of a food processor. Process to a smooth paste; when the mixture is well blended, add the cream, milk and egg yolk; add the parsley and salt to taste. Blend until the sauce is very smooth. Meanwhile, cook the pasta until just al dente, then toss it with the sauce. Cook chard in salted boiling water until wilted, 1–2 minutes. Using a slotted spoon transfer chard to a bowl of ice water until cold; drain and squeeze completely dry; set aside. Heat oven to 400°. Grease a 9″ x 13″ baking dish with butter; set aside. Heat 6 tbsp. butter in a 6-qt. saucepan over medium-high; cook garlic and onion until golden, 6–8 minutes. Stir in flour; cook for 2 minutes. Whisk in milk and cream; cook until sauce is thickened, 4–6 minutes. Remove from heat; crumble half the West West Blue into pan. Stir in reserved chard, the nutmeg, salt, and pepper; pour mixture into prepared baking dish. Toss remaining butter, the pumpernickel, and walnuts in a bowl; sprinkle mixture over chard. Crumble remaining cheese over top; bake until chard mixture is bubbly and pumpernickel is crisp, about 30 minutes. Unbelievably delicious, good on everything from toast to chicken to pasta or eggs, to baked potatoes, and let’s try it on turkey! Off the heat, add the West West Blue, Parmesan, salt, pepper, and parsley. Whisk rapidly until the cheeses melt and serve warm. If you must reheat, warm the sauce over low heat until melted, then whisk vigorously until the sauce comes together. Heat the olive oil in a large frying pan/skillet over medium high heat. Fry the pears for 3 minutes a side, and while they are frying whisk the Marsala and honey together in a cup. When the pears are beginning to caramelize, add the Marsala-honey mixture and let it bubble up around the pears, and then transfer them a plate. Add the walnuts or pecans to the dark juices left in the pan and stir-fry them for about a minute until they are themselves darkened in part and sticky all over. Pour this on the pears and top with the slices of West West Blue.